Mr. Fleming is a former president of the Society of American Historians. He published his first book, "Now We Are Enemies," in 1960. It is now back in print for its fiftieth anniversary. This article is taken from the introduction of the new edition. In 1957, as the supposedly humdrum decade of the Fifties wound down, I was an aspiring novelist and busy magazine journalist. One day I received an assignment from an editor to write a one page article on the Battle of Bunker Hill. The editor was not particularly interested in the American Revolution—nor was I. He had developed a feature in his magazine, “The Day It Happened,” using dramatic stories from the past that took place in twenty-four hours or less. This qualified Bunker Hill for inclusion. I was going to Boston on another assignment and decided to do some research while I was there. I was astonished to discover that no one had written a book on Bunker Hill in the past eighty-five years. I was even more amazed to discover in these earlier histories how ferocious—and complex—the battle had been. All I really knew about it was the slogan, “Don’t fire until you see the whites of their eyes.” I did not even know who had said these famous words. Before I left Boston, I took a taxi out to Bunker Hill and visited the monument. I climbed to the top and looked across the Charles River at Boston. Around me was a densely populated neighborhood. The once bare hills and fields of the Charlestown peninsula had vanished. But the view from the top of the monument gave me at least an inkling of what the men who built a fort there saw at dawn on June 17, 1775, after their night of frantic digging. Back in New York, I went to the New York Historical Society to see what they had to offer on Bunker Hill. I soon encountered the papers of General Horatio Gates, one of the principal American commanders during the Revolution. I discovered dozens of letters and reminiscences about the battle. Although General Gates had not fought at Bunker Hill, he lived into the 1800s and in the early years of the historical society his papers apparently became a sort of depository for the papers of other Revolutionary War soldiers. The librarian who showed me this treasure trove remarked that I was the first person to consult it in decades. The Civil War, with its huge casualties and its ambivalent racial aftermath that still haunted us, and the two World Wars of the first half of the twentieth century had shoved the Revolution into a dim, seemingly irrelevant past. But the more I read, the more the centrality of this founding experience became vividly evident to me. Why? There were many reasons. Perhaps most importantly, the Revolution created the basic components of the word “American.” It was the beginning of my fascination with this era that would produce many more Fleming books in the years to come. Next I began to realize the symbolic dimensions of Bunker Hill. It stood for something large and important in the American psyche. It was the first battle in which Americans challenged the prowess of the British Army, then considered the best in the world. Fifteen years before, these soldiers had won a global war with France and Spain that drove the French from North America and established the power and wealth of the British Empire. The fighting that broke out at Lexington on April 19, 1775, and was renewed at Concord and along the road during the British return to Boston, was an outburst of anger that could have been dismissed as a misunderstanding. Bunker Hill was a deliberate and conscious effort to prove that the Americans could meet their supposedly unbeatable red-coated opponents in a formal battle. Newly commissioned General George Washington, on his way to take command of the impromptu army that had sprung up after the bloodshed on April 19, supposedly asked, when he heard the news of Bunker Hill, if the Americans had stood and fought. When told they had, he replied: “Then the liberties of our country are safe.” Washington never said this, but the widespread belief in the story underscores Bunker Hill’s significance. I decided I would not only write an article about Bunker Hill—I would write a book. 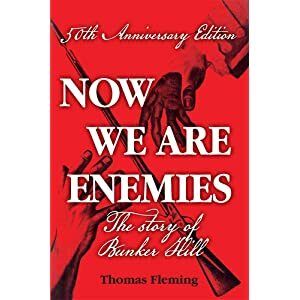 One of the most enduring memories I have of the publication of Now We Are Enemies is how often readers spoke to me or wrote to me in disbelief, confessing they never knew that the battle had ended in headlong American flight, leaving the British in possession of the disputed hill. The climax to this phenomenon was the reaction to the British edition. The headline of one review read: YANK SAYS BRITS WON AT BUNKER HILL! Even the Mother Country had swallowed the myth of an American victory. For the purists, there was the necessary correction of what looks like a fundamental misnomer: the battle took place on Breed’s Hill, not Bunker’s Hill. But there is a non-purist reply to this claim: Breed’s was really an extension of the larger hill. Only a year ago, I received a letter from a member of the Breed family, telling me how they had struggled for two centuries to get their name into the history books, but had finally, despairingly, accepted the inevitable and become Bunkerists like everyone else. I sent him my sincere sympathy. Of course, the British victory was what military historians call “pyrrhic.” The term is derived from the experience of King Pyrrhus of Epirus, whose army suffered staggering casualties in defeating the Romans at Heraclea in 280 B.C. Pyrrhus famously said: “One more such victory will undo me.” The British made similar comments after Bunker Hill. They knew their horrendous casualties, inflicted by the supposedly amateur American militiamen, amounted to a serious defeat. Perhaps the most interesting part of researching and writing Now We Are Enemies was the discovery that the Americans were not exactly amateur soldiers. The Massachusetts men were an embryo army that had been drilling and preparing for battle for almost a year. The New Hampshire and Connecticut men were led by veterans of Roger’s Rangers, the daring partisan regiment that had won fame in the global clash with France and Spain that we call the French and Indian War. But the essential significance of the battle was not altered by this discovery. One of the fascinations of history is to contrast what we know now with what the actors in the drama thought centuries ago. More important was the discovery that not every American who was ordered to Bunker Hill was a hero. Some ran away, and a surprising number declined to go. This was my first encounter with the hard truths that lay behind the “golden glow” version of the Revolution, in which everyone was an unhesitating patriot. The men (and women) of 1775 were by no means united in their views of the looming upheaval. Nor was everyone prepared to meet the terror and chaos of battle when it exploded around them. Now We Are Enemies was my first book. Its success amazed me. It was a main selection of the Literary Guild, and it was condensed in Reader’s Digest. The latter alone gave the book a readership of 18 million. It was, as far as I know, the first time that a nonfiction book about the American Revolution had attracted such a huge audience. I particularly valued a phone call from DeWitt Wallace, head of Reader’s Digest, in which he told me how startled he was to discover that this forgotten war had soldiers as daring and memorable as those of World War I (in which he had served) or World War II. The symbolic power of Bunker Hill was brought home to me in another way. I received dozens of letters from readers who claimed their ancestor was a member of the Andover or Concord or Springfield company, and had fought at Bunker Hill. Why hadn’t I mentioned him? Frequently, I was able to consult the muster rolls of that company and dolefully inform the writer that his ancestor was unlisted. Or worse, that the entire company had not fought at Bunker Hill, but had remained with the two thirds of the American troops that manned the other forts and trenches encircling British-occupied Boston. The sixty-nine year old Franklin had not fought at Bunker Hill. He had not set foot in Boston for the previous twenty years. There was no reason for me to do any research about him. I found the quotation by accident as I was finishing the book. It confirmed my confidence in what I had written—it was almost as if Ben himself had arranged for the discovery. I would later thank him by writing his biography—The Man Who Dared The Lightning. Looking back, I can see 1960 was a good time for this book to appear. It was the year when two young men—John F. Kennedy and Richard Nixon—fought for the presidency of a United States that had become the most powerful and prosperous country in the world. Both candidates had been born in the twentieth century—the first to reach for this prize as spokesmen for the generation that had fought and won World War II. They were both keenly aware that their country had just survived a nightmarish encounter with a new enemy on the barren hills of Korea, and was now confronting brutal challenges from communist tyranny around the world. I like to think it is somehow fitting that the winning candidate—Boston born John F. Kennedy—declared in his inaugural address: “Ask not what your country can do for you, but what you can do for your country.” That was a sentiment almost every man who stood and fought at Bunker Hill would have endorsed. Fifty years later, with America facing challenges from another lethal enemy, maybe it is a good time to reread this book. What a wonderful story. I will be certain to read this book as soon as possible.